The count down to halloween has begun! For those of you who’ve been following my Halloween Girl Gang Special, you will have seen me dress as a Victorian Deer and Beetlejuice. 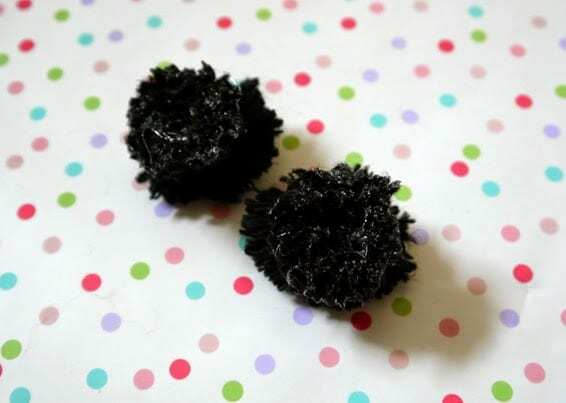 Part Three is Witch inspired, and, whilst the girls had super fun hats to wear for the occasion, I wanted to make something extra special for my costume. I’ve always been in love with Mexican Day Of The Dead outfits so decided that a witch in mourning would be the perfect way to put my stamp on the shoot. I made this floral wedding veil in less than 30 minutes so I thought it would be the perfect DIY to share as it’s so quick and easy to make, it’s super affordable and it looks oh so stylish! 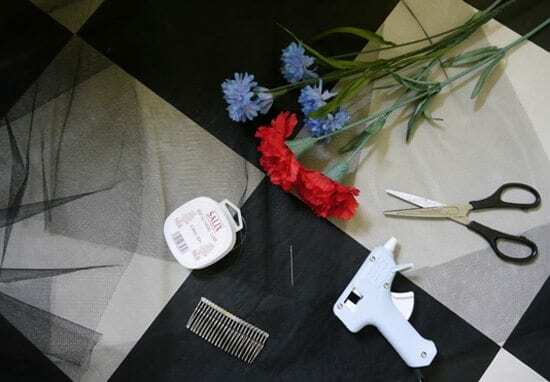 For this tutorial you will need some netting material (I used a meter because I wanted it to be doubled over, super long and a ‘high fashion’ style, but half of that would be plenty too), some clear plastic threading or fishing line, a hair comb, a glue gun, scissors, a needle and some fake flowers. 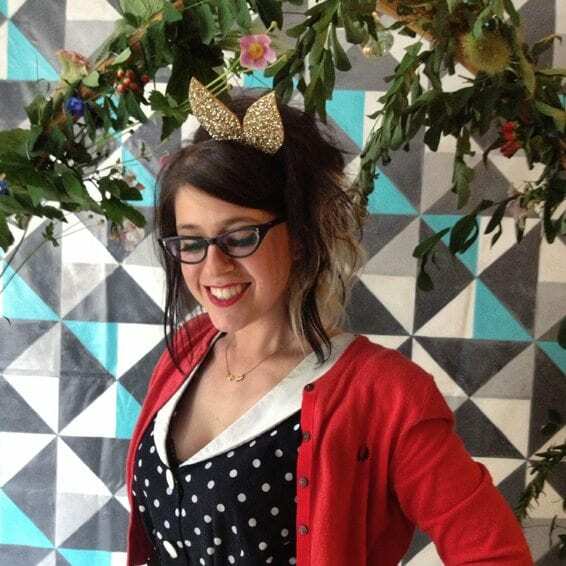 I picked all of these things up at Hobbycraft, but you can find everything in good fabric and craft shops. 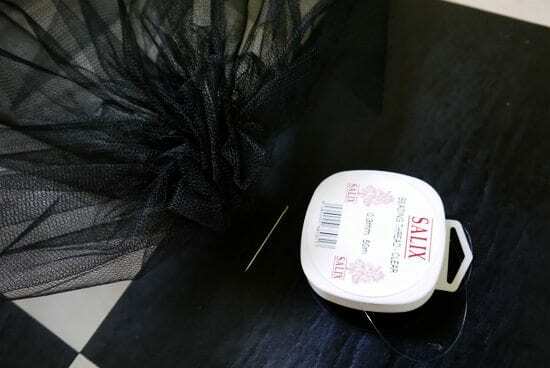 To make this noir veil you’ll need to ‘bunch up’ and stitch your netting together so it creates a nice gathering on the comb. Do this by notting the end of your clear thread and looping through the corner of your netting a few times so it stays put. Then gather up the rest of the netting and sew through each fold so it sits nicely and repeat untill you get to the other end of the material. When you’re happy with it, stitch all the way back through to make sure it’s secure. At the end, do a couple of repeat stitches as before so it holds together by itself and knot the thread for good measure. 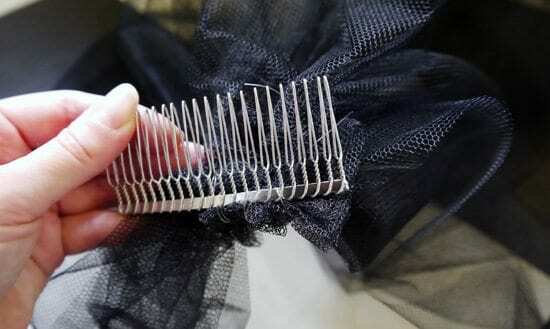 The next step is to attach it to your hair comb. 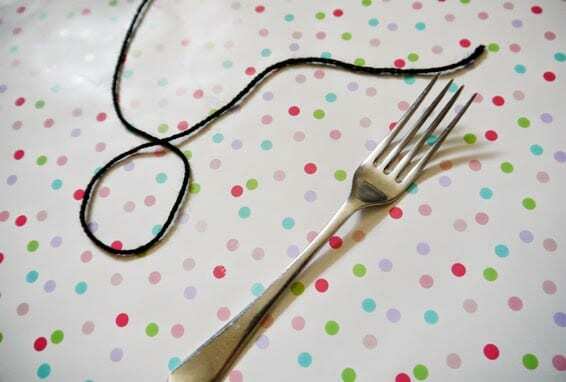 You can do this without cutting the string from before, but if you have to start again, just remember to do a few extra stitches so the thread stays in place before you begin. 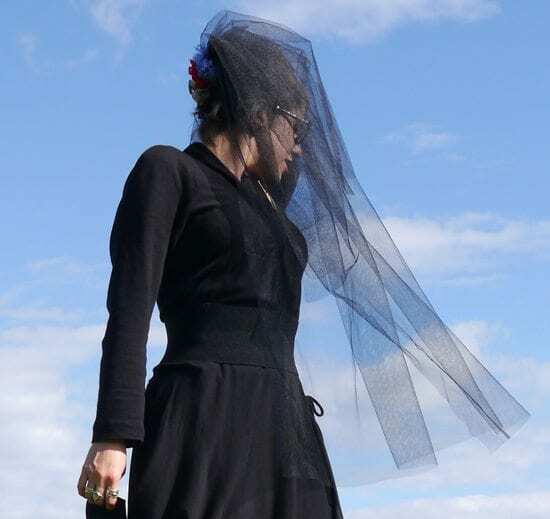 Bare in mind how you want the veil to sit on your head; I wanted mine to go into the back into my hair beehive so it would go up and over my head before falling on my face. 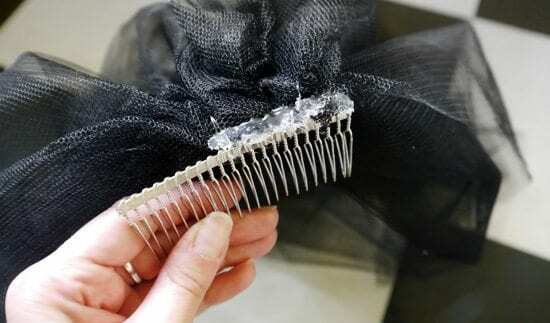 To do this the veil needs to sit above the curve of the comb. Have a play around with them now to make sure you attach them together the right way around. When you’re ready, stitch through each fold of netting then stitch through each ‘comb section’ in a loop so it attaches. As before, go from one end to the other then back again to secure it. When you’re happy with it, double stitch and knot the thread then trim off any excess to make it more neat. Wonderful! Believe it or not, that’s the hardest part done. Good work! 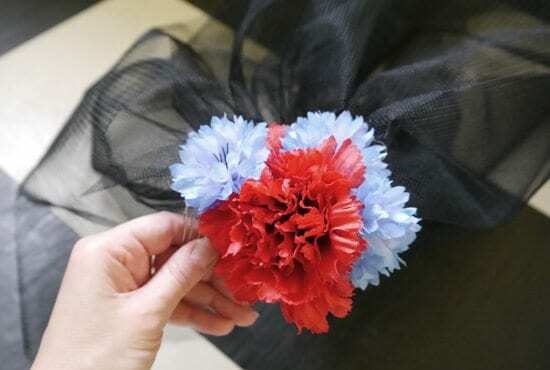 Next you get to have a super fun Halloween moment – behead your flowers!! Using just normal scissors, trim at the base of the flower leaving a few millimetres of plastic stalk at the end. Once you’ve done this with all your flowers, decide how you want them to sit on top of your netting. 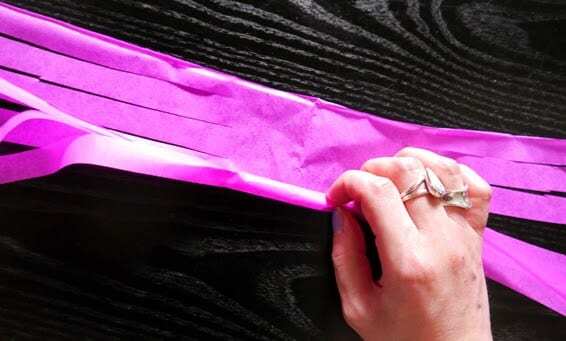 They need to be positioned over the gathered material so you can attach them and secure everything in place. Once you know how to position everything, use your hot glue gun to attach the netting to the comp (make sure you only glue the metal bar bit and not between the throngs). Work backwards (starting from the metal) so it covers enough of the netting to hold all your flowers in place too. 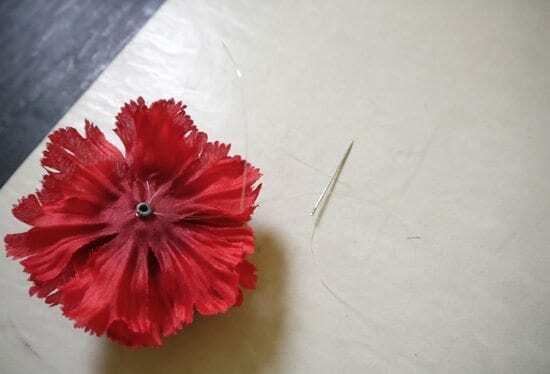 The glue will try clear and should be totally hidden under the petals, so use as much as you need to make sure everything is attached properly. 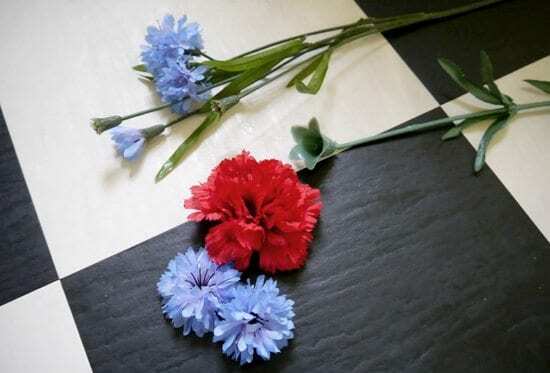 Whilst the glue is still hot, pop each flower in place and give it a firm push to make sure it holds. The glue will only take a minute to dry and before you know it your new master piece will be ready for your spooktacular night out on the town. Wooooooohooo! 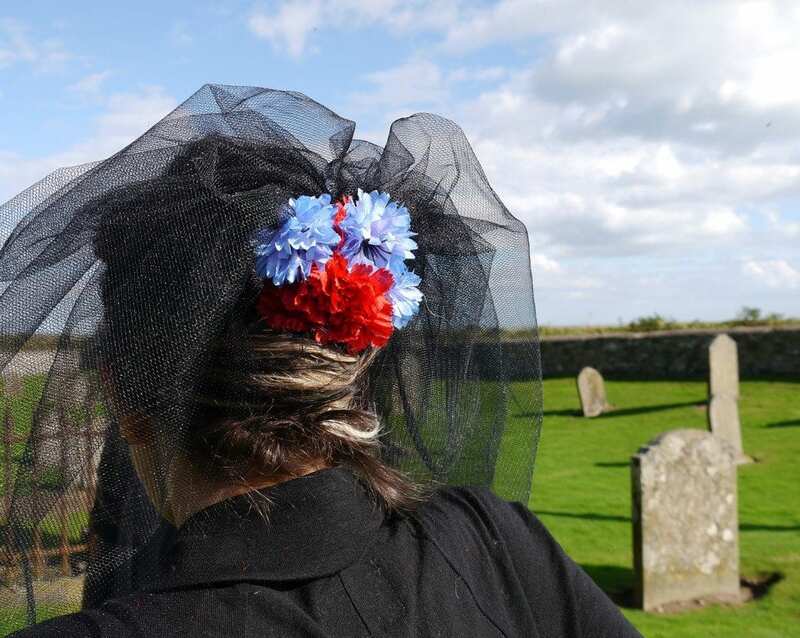 To see how I wore mine, pop back tomorrow to see Part 3 of our Halloween Fashion Shoot and I’ll even tell you a scary real life ghost story to get you in the mood for all Hallows Eve. . . Mwah haha! I’d love to see how you wore yours if you’re inspired by my tutorial! Be sure to tweet me @MissVickyViola or share a picture with me via instagram @MissVickyViola – you’ll make my day! 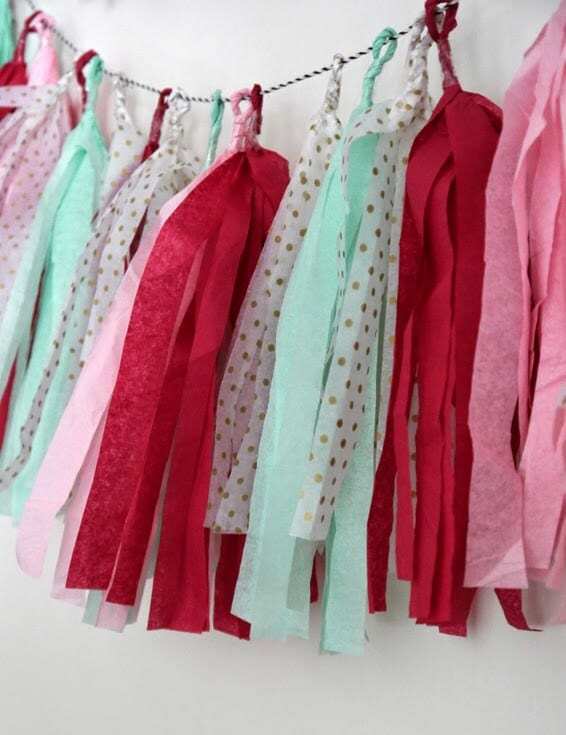 All you need is some lovely tissue paper, scissors, string and a little bit of glue or tape. To start with, I thought I would show you how to fold the tissue for the quickest way to cut it to size. Sometimes when you buy it it’s folded correctly, but just incase you’re working with a flat sheet (or iron it to get the kinks out) I thought I would go over it again. 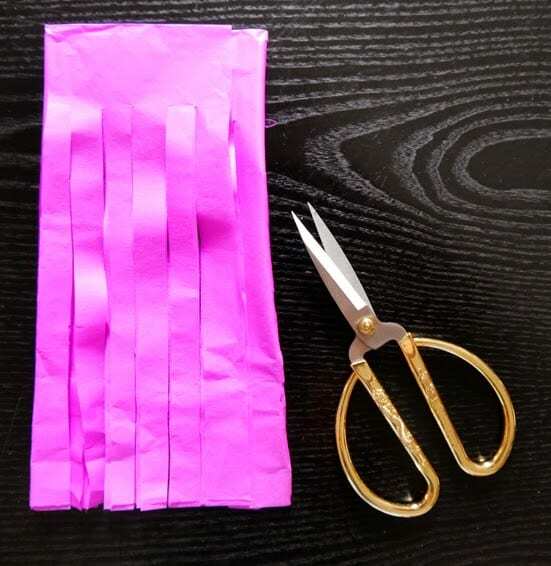 Using your scissors, cut the length of the tissue paper into several small fringe strips. You need to leave around 2cm from the top (2cm down from the fold), so take your time. So, it should look like 6) once it’s trimmed to size. 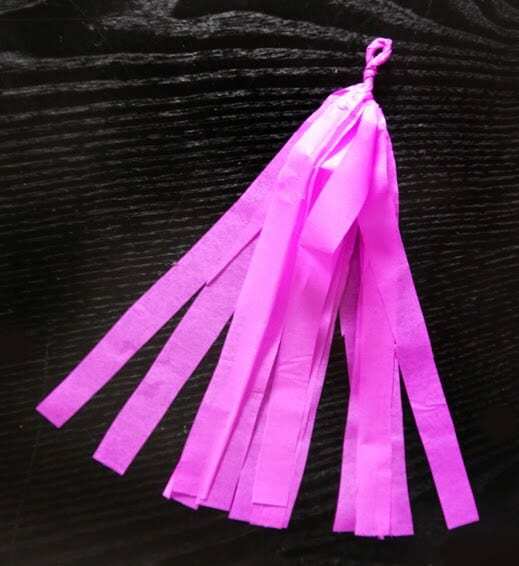 7) Gently unfold the tissue paper length-ways and you’ll notice where the sections to each piece is. 9) When you open up these you’ll see they are all joined in the middle. Perfect! 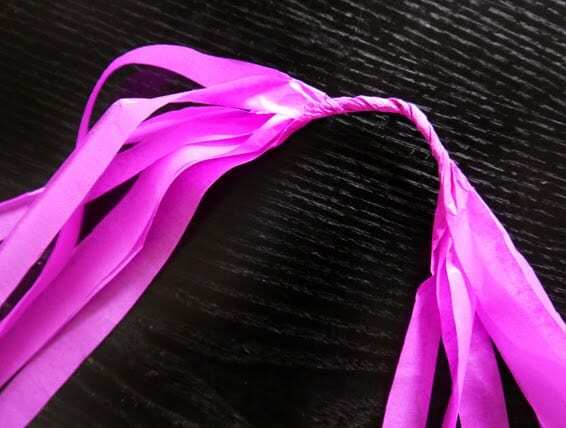 Once rolled, you will be able to twist the tissue paper like so… this will strengthen the join. When that’s done, the last thing to do is twist it all together tightly so you get a hoop at the top. Excellent! Isn’t it the cutest bunting you’ve ever seen? 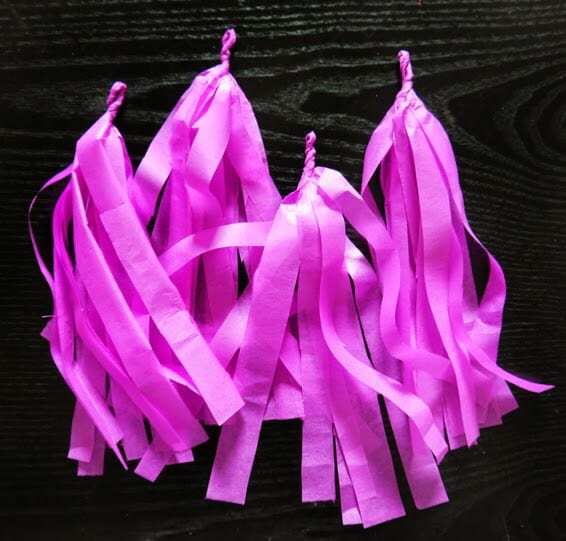 There are so many beautiful colour combinations you can make these in you’re going to have garlands for every occasion! Weddings, hen dos, birthday parties and baby showers can all be created to their colour schemes. 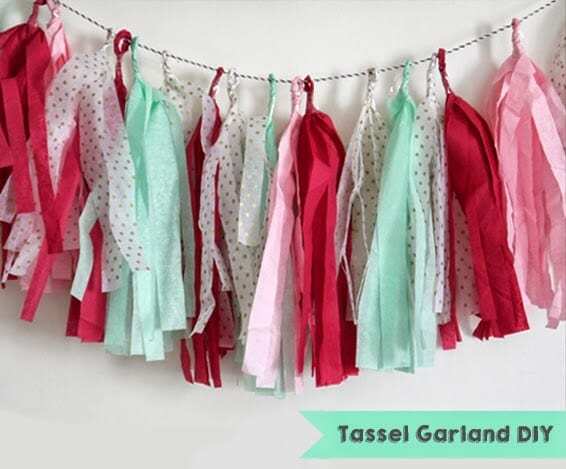 This set will be making an appearance at our Etsy Craft Party but I’ve got plans for them to hang in our studio once they’re done — well, a tassel garland is for life, not just for Christmas heehee! 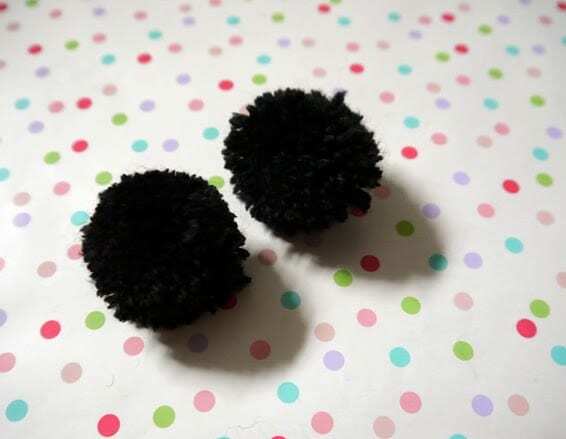 A short and sweet DIY this week! On Saturday I popped into our favourite Chinese Supermarket in Edinburgh and I spotted that they had tapioca pearls in stock. 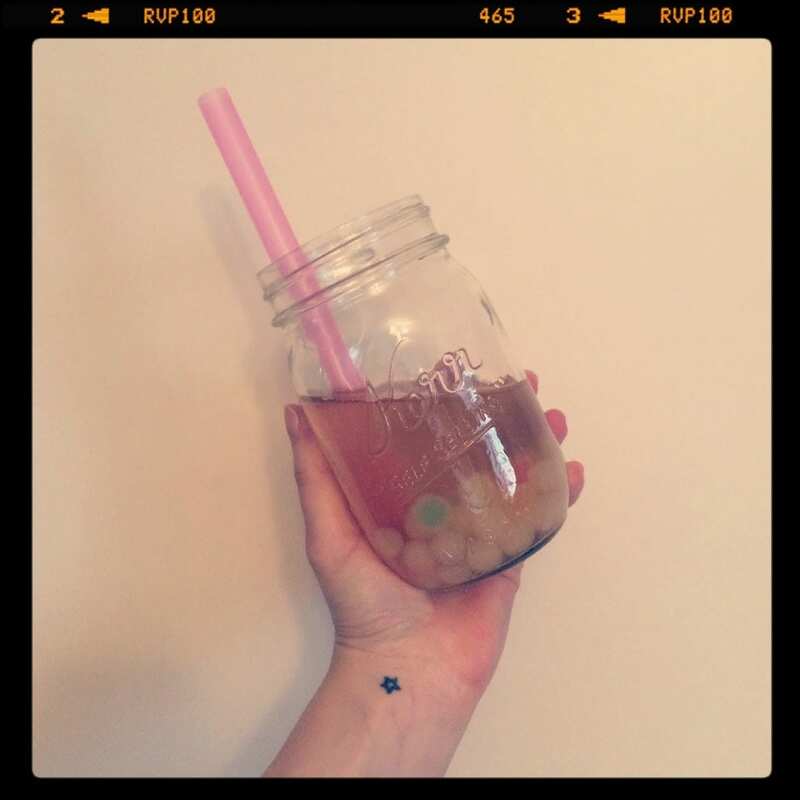 Since I discovered it a couple of years ago I’ve been totally obsessed with Bubble Tea and I can finally make it at home any time I want – YAY! 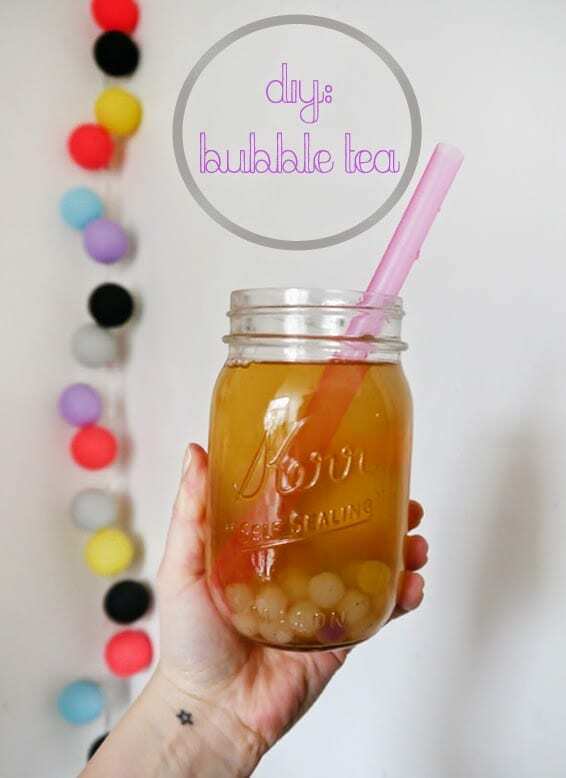 For anyone who’s never heard of it, Bubble Tea is super popular in Asia (esp Japan) It’s either made as a sweet iced green tea (often flavoured like Pineapple – my fave), or as a milk tea. Actually you can get these hot too, but I’ve only had it cold. 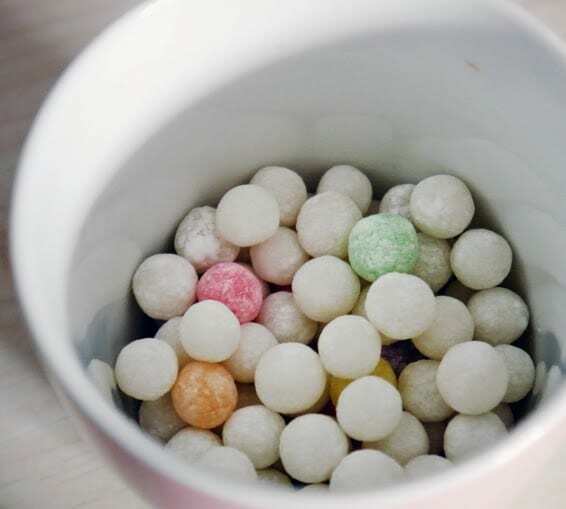 These tea’s are filled with either tapioca pearls or boba – balls that look the same as these but instead of being squidgy they burst when you bite them and they’re filled with a sweet juice. That’s right, you’re drinking juice with chewy balls in. It sounds weird, but it’s awesome!! 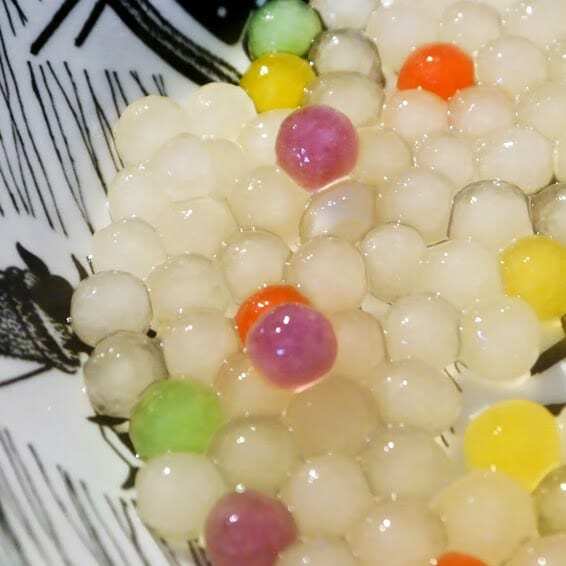 Before you make them, the tapioca balls are hard and look like this. According to the ones I bought, for every 1 cup of these, you need 10 cups of boiling water. As I’m not making it for the whole city, I only needed half a cup of balls, so just 5 cups of water. All you need to do is boil the water in a pan over a high setting, and add the tapioca pearls in. Gently stir them until they start to become plump and start floating. Pop the lid over the pan and let them simmer on a medium heat for 5 mins. Once that’s done, add in a couple of tablespoons of honey or sugar if you’d like to make them sweeter (they’re kinda tasteless, but I don’t mind that) Taste them to check if you need to add any more in – it’s all down to preference. Ready? Take them out of the water and set them aside… don’t they look beautiful? Such pretty bubbles!! Add in a couple of ice cubes and fill with your sweet green tea. 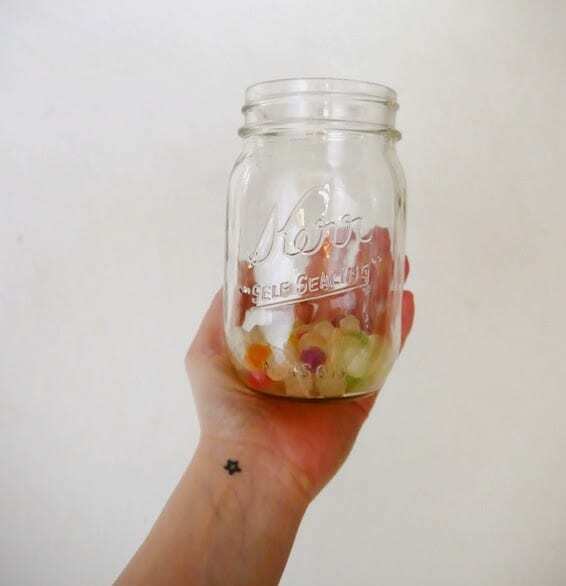 I topped mine off with a little bit of lemonade to make it lightly fizzy too… that’s not standard, I’m just super excited to try lots of new things with my favourite new ingredients!